SCHOOL CHOICE - VOTE NO: Government funding of private/parochial schools brings with it government controls, which is the problem with Public Schools now! The state should fund education by allowing dollars to follow the child instead of the bureaucracy, through a program which allows parents the freedom to choose their child's school, public or private, while also saving significant taxpayer dollars. Yes or No. REPEALING OBAMACARE - VOTE YES: The mandate for purchasing insurance and the numerous other hidden controls in the ‘Affordable Health Care’ plan will destroy our liberty and make seniors’ health care approval subject to the decision of an unelected bunch of non-doctors after weighing the cost of the treatment against the projected life span of the senior. Congress should immediately repeal the Patient Protection and Affordable Care Act (otherwise known as Obamacare) and reject the rationing of healthcare by government or the intrusion by government into the doctor - patient relationship. Yes or No. PUBLIC PRAYER - VOTE YES: Government should be prohibited from restricting the content of public prayer. Yes or No. BALANCED BUDGET / COMBINING GOVERNMENT GROWTH - VOTE NO on Balanced Budget Amendment: Unintended consequences abound. Budget should be balanced without an amendment ASAP when the revenues are equal to or more than the outgo. The BBA would simply give cover to the big spenders to raise taxes to meet runaway spending. Disputes over cutting the spending or raising taxes would result in a Supreme Court decision, thereby infringing on the separation of powers between the Legislative, Executive and Judicial branches of government. Bad idea but has emotional appeal. Out of control spending should be stopped at all levels of federal and state government through constitutional amendments limiting any increase in government spending to the combined increase of population and inflation without voter approval. Yes or No. 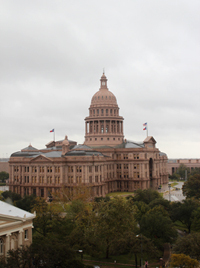 REDISTRICTING - VOTE YES: The Texas Legislature should redraw the court-imposed lines for Congress and State legislative districts in its upcoming session in order to remedy inequities. Yes or No. can you please explain your stance on prop 5? (redistricting). I was under the impression that the current map was drawn to favor the GOP...why would we want it redrawn?